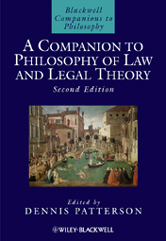 The articles in this new edition of A Companion to Philosophy of Law and Legal Theory have been updated throughout, and the addition new articles ensures that the volume continues to offer the most up-to-date coverage of current thinking in legal philosophy.Represents the definitive handbook of philosophy of law and contemporary legal theory, invaluable to anyone with an interest in legal philosophy. Now features ten entirely new articles, covering the areas of risk, regulatory theory, methodology, overcriminalization, intention, coercion, unjust enrichment, the rule of law, law and society, and Kantian legal philosophy. Essays are written by an international team of leading scholars.